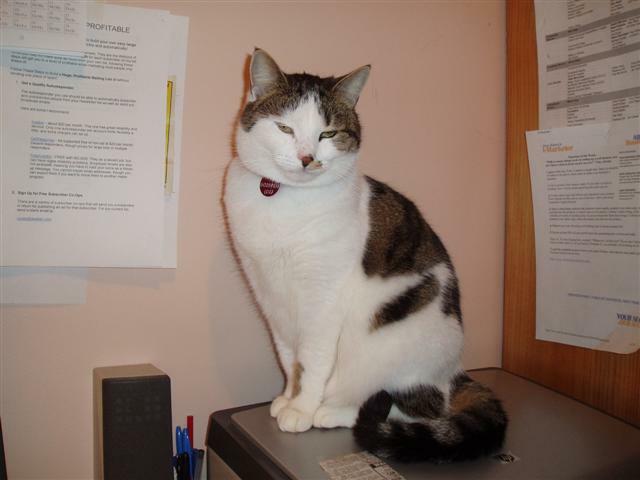 Paul’s adopted ‘daughter’ Bella. Hello all readers of the Paulseagypsy blog. Paul is busy learning, he booked himself into a demanding 10 day seminar and we’re just patiently waiting to hear from him again. Hello again to everyone.Welcome to all whose e-mail address I have finally found or corrected and a big warm hello to my new friends from my travels through Thailand – thankyou for your friendship and guidance during the journeys we shared.Earlier in the week I bid farewell to Thailand and arrived in India, a land that I am finding as challenging as it is fascinating.Flying into Delhi I felt unsettled, having heard stories over the years from friends and travellers of the manic energy of Delhi airport and the in-your-face locals vying for your business. Taking a few deep breaths I ploughed through the customs gates to the greetings of an ocean of faces – shouting, waving, pulling at my attention (and luggage). Yes, I had finally arrived and could do nothing more than step forward into the sounds, the colours, the dust and the smells – all the sensory overload that late-night Delhi has to offer to the weary traveller. My first warning to all – the roads in India are insane. Seriously, I can’t see any rules besides respect and give way to all other vehicles bigger than yours (also to cows – they’re sacred and often stop the traffic!). Climbing into my ride that night, I buckled up and just hung on for what felt like a carnival ride on bad acid. Everyone, and I do mean every car/ truck/ motorbike/crazy taxi, just loves their horn. The sound is your constant companion on the roads. And then when darkness descends the headlights also come into play – to be flicked on and off repeatedly like a rave party stobe light (with the blaring horn to accompany, of course). Appararently all this is a warning to the unwary – a ridiculously dangerous attempt at overtaking is about to be attempted – get the hell out of my way!! Having survived it’s traffic snarls, I decided Delhi did not really appeal to me. The dust, the heat, the crush of humanity and the thickly polluted air all left me with little desire for sightseeing. Perhaps I just didn’t want my initial experiences in India to be an overcrowded, dirty city – all this can wait while my senses adjust to the country. 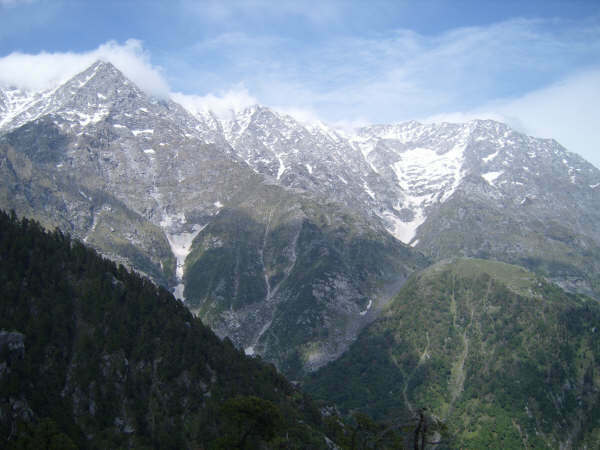 My need is for fresh mountain air, serenity and open spaces – so I head north toward the Himalayas and the alpine village of McLeod Ganj. At this point I should note my second warning to the uninitiated – Indian food takes to time for the Western body to adjust to! In the months before I left Australia I was intent on building a cast-iron stomach, a digestive system that could cope with anything. I consumed herbal brews and bitter potions, all to to build digestive powers of herculean proportions. Alas, on my third day, all failed and I felt myself on the way to becoming very,very sick. Now, facing a 13 hour overnight bus journey is difficult enough in the best of health. But I was determined to get away from the city, to face illness and recuperation there was inconceivable. So onto the bus I climbed, and applied all my reserves of willpower and energy to hold myself together, every possitive affirmation within my soul toward keeping myself functioning on the road. And I did it. On arrival in McLeod Ganj, spurred by the crisp morning air of the Himalayas and by now becoming consumed by cold shivers and stomach cramps, I found a pleasant guesthouse and barricaded myself in my room. For 20 feverish hours I slept, only surfacing from my hibernation for some water and the herbal remedies I had carried all this way (thankyou Zen Health). The next morning, I woke with an almighty thirst. Weak and lightheaded, I slowly drank more water, another round of herbs, topped myself up with reiki and assessed my condition. Better in fact, my appetite was back with a vengeance. A good recovery, I have spoken to many travellers who have stayed sick for days, weeks, even months as their bodies cope with Indian conditions. My pre-meal ritual is to now wash hands thouroughly with disinfectant swabs and post-meal, if I think a meal may be a bit sus, I throw back a shot of vodka and burn all the germs out. It works a treat and I’m now loving the cuisine. Having now recovered and free to begin exploring my surrounds, I should share some detail on the village of Mcleod Ganj. When the Chinese began their occupation of Tibet, the Tibetan Government, led by his holiness the Dalai Lama, fled to India and settled in Dharamsala/ McLeod Ganj. Exiled Tibetans, unable to return to the unrest in their country, have made this region their home, carrying on their culture and promoting the teachings of Buddhist philosophy and way of life. It is a peaceful place, where you share the streets with robed monks and buddhist followers, brightly coloured prayer wheels and prayer flags. A place where the mountain air seems to resonate with deep chanting voices. 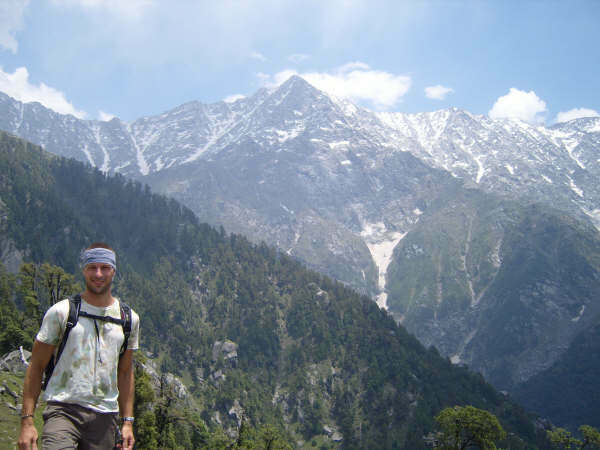 Many international travellers come to McLeod Ganj for its beauty, a taste of Tiibetan culture and craftwork, and also for the oppurtunity to learn in a spiritually uplifting environment. A diverse range of courses are on offer here – Meditation, Yoga, Reiki and many styles of natural medicine. This is perfect for this point in my journey. Lately I have been craving some structure to my days, a course of study should remedy this. I’ve been fortunate and have been accepted into a 10 day live-in course in Buddhist philosophy and meditation beginning tommorow. I will be attempt to share any insights with you all in my next journal. In the meantime, I have been hiking any mountain trail I can find. The views are magnificent, hiking to a high ridgeline over the valley brought me to the beginning of the Himalayan range. Huge, icy peaks dominate one skyline, and in the other direction you can see for countless kilometers across the valley floor. 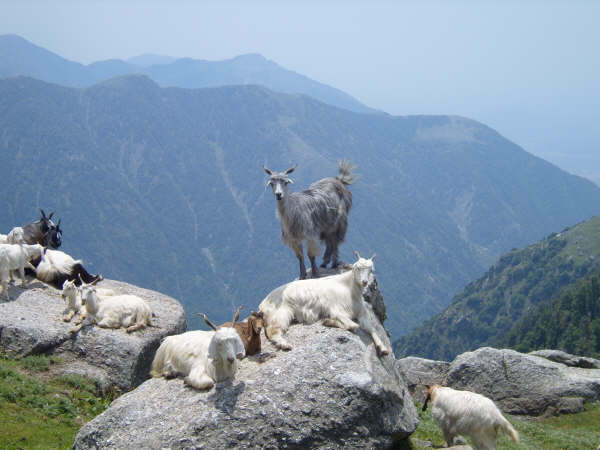 Sharing the trail with herdsman and mountain goats, sherpas and pack donkeys it is a colourful experience. Along the paths, where the views are most open you will often find a small tea stall – really just a tent on a ridge where a friendly local can pour you an energy-restoring brew of spiced tea. Here, hikers gather and swap valuable information and tales of adventure of the trek ahead. It’s an excellent, fitness enhancing experience, and I’m planning to explore as much of these mountains as I can fit in. Wishing you all happiness, love and light until next time. Hi Mum and Dad, Everything is well with me, I’ve made a fast recovery from my stomach bug. Lots of energy and a huge appetite again. I think I was just adjusting to the India bugs. Today I went out for a walk after breakfast and just kept going and going. Hiked up to a ridgeline facing a glacier and the first line of the Himalayan range. I’m staying at just under 2000 meters and hiked to maybe 2600 meters today. The scenery is amazing, much like what I remember from Switzerland.Meeting many of the characters along the way was a highlight, other travellers and the local mountain nomads with tea stalls along the trail and herders with goats, yaks and donkeys all sharing the path. Whilst wildlife spotting I saw some huge mountain eagles and a mongoose. I enjoy the serenity of the mountains and will spend quite some time here. Many other travellers have given me ideas from their experiences and will follow their path. Everythings so cheap here, my room is clean and comfortabe and costs about $4.50 Aus for the night and food is about $2 for a big meal. I am looking into some courses here in natural medicine and buddhist meditation. I heard about Uncle J from Deb, very sad. I also hear there has been good rain, I’m hoping it will be all green again when I come home. Let me know if any mail, bills, etc. has arrived. How is my daugther? Is she becoming more friendly? Tell her I miss her. I have safely arrived in McLeod Ganj and feel peaceful and happy here. The bus trip was long (13hr) and overnight. Indian buses are not designed for long westerners legs and what little room I had disappeared altogether when my front neighbour reclined for the night. Big crush! Think I’ll opt for the sleeper here on, but I did sit next to a very interesting Norwegian guy who has been here years studying Buddhism and trekking. Got heaps of useful info and tips from him. Have been quite ill with stomach bugs. Managed to stay ok during travel here but fell in a heap after I settled. Very dizzy and weak. Slept 20 hours yesterday and have improved heaps. Today the appetite is back with a vengeance and slowly getting my energy back. Will take it easy another day, explore around town and start some day hikes over the next days. Buddhism, meditation and natural medicines, craft shops, diverse restaurants and cafe’s. My room is clean and quiet and costs about $4.50 Aus for the night. I think I’ll stay a while.